Alex Smits, family man from Indiana, supposed he would spend some quality time with his family by taking them along on his business trip to Israel. “What could go wrong?” he thought. Larry Blumberg, mergers and acquisitions, Westchester, NY, at least had a reason to take his family—his son’s bar mitzvah. Murphy—Palestinian, Muslim, hustler in the old city bazaar, with West Bank street smarts. The old city is not large enough to keep the Smits kids from running into anyone of equal hyper-tension. It was an inevitable coincidence. Fourth-grader, Mic, might be the youngest in the family, but no one had yet discovered a dose of Ritalin that would keep the boy from turning the most innocuous day into a high-octane adventure. The characters fail to notice that they represent the three faiths that have kept Jerusalem the most explosive, if not bloodiest, local in history. It may look passive to a tourist, but the Smits kids, their Jewish pal, and their new-found Palestinian friends walk unwittingly into a maze no one could have anticipated. 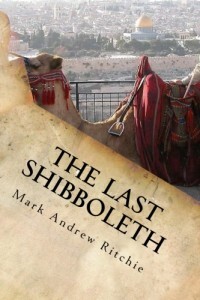 Purchase The Last Shibboleth today.